The Sonoma County Winegrowers were proud to partner with the Guild of Sommeliers for their annual Top|Somm Competition that concluded this weekend in Sonoma County with their championship round. Top|Somm is a competition for wine service professionals administered under the framework of the Guild of Sommeliers, a non-profit organization that helps its 11,000 members worldwide broaden their knowledge of the world’s wine regions, enhance their beverage service skills, network with other wine enthusiasts and stay up to date on industry news and trends. This national competition is judged judged by Master Sommeliers and affords wine service professionals the opportunity to fine-tune their skills and compete for the title of America’s Top|Somm. The competition recognizes excellence and encourages mastery of wine and spirit knowledge and service. There are four regional competitions throughout the U.S. culminating with a National Championship hosted in our own backyard here in Sonoma County. SCW’s Karissa Kruse and Sean Carroll were on hand at their awards reception and celebration Sunday night to recognize all the top sommelier participants and winners who were in town from all over the country, including New York City, Chicago, Boston, Austin, Seattle, and the San Francisco Bay Area. We would like to congratulate this year’s Top|Somm winner Allegra Angelo of Mercer Restaurant Group in San Francisco, who participated in our annual Sonoma Summit program two years ago and continues to be a strong ambassador for our region. Special recognition also goes to Vincent Morrow of Gary Danko Restaurant in San Francisco who won Top|NewSomm. Morrow got his wine education start working in a local Sonoma County tasting room several years back. In addition, Karissa and former Commission Board member Steve Sangiacomo lead a lively presentation and conversation about our sustainability efforts here in Sonoma County. We geeked out on various sustainable vineyard practices and discussed why it matters to wine quality, the preservation of agriculture in Sonoma County, and more. It was a great opportunity to discuss our sustainability efforts with a room full of talented and influential sommeliers who are on the front lines every day recommending wines to consumers. Hosting the Top|Somm Competition in Sonoma County would not have been possible without the continued support and sommelier education leadership of Rodney Strong Vineyards and Iron Horse Vineyards. We would also like to recognize a number of winegrowers and wineries who supported our efforts and supplied wines for the awards dinner. They included Balletto Vineyards, Dutton Estate, Martinelli Winery, Mauritson Wines, Mounts Family Winery, and St. Francis Winery & Vineyards. 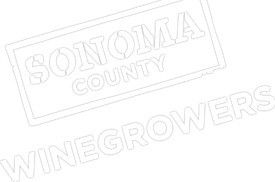 © 2019 Sonoma County Winegrowers.